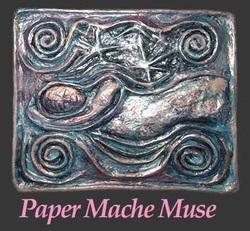 ​What Makes This Site Different From Other Paper Mache Sites? You will see some of my work along with stories of what inspired it. You will see how working in this way can help you stay actively involved in the mythic realm through stories, spirituality, psychology, visions and other aspects of the intuitive side of life. You will see how the mythic world can manifest in work with paper mache. For in-depth how-to information you can find lots of really good books, websites and blogs with great demos, helpfull information and beautiful examples. I will provide some links that I like in Resourses. I will offer some of my techniques on the blog page but I will emphasize how you can use the medium to manifest your mythic quest. ​your work with this humble medium. Part of a 3 mask series I will display later.